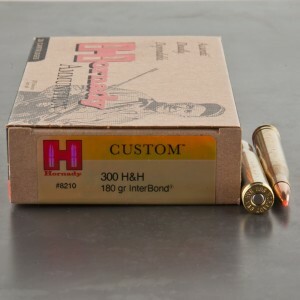 300 H&H ammo is a proprietary caliber produced by a company known as "H&H". The H&H in 300 H&H stands for Holland and Holland, a British firm well known for building some of the best custom hunting pieces on the planet. The H&H brand at one time was the game in town when it came to rifles powerful enough to hunt elephants, lions, and water buffalo. 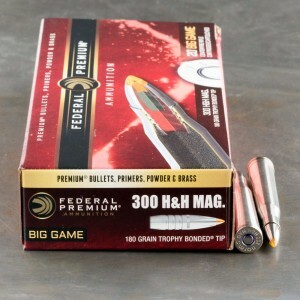 The 300 mag ammo is an extension of the H&H brand, and H&H has given this cartridge the same quality they put in their firearms. 300 H&H Magnum ammunition was created in 1925 to offer superior ballistics in the 30 caliber niche of bullets. The round offer superior ballistics to the classic 30.06 and is capable of pushing 220 grain rounds at more than 2,700 feet per second. The 300 H&H round is capable of taking all but the largest of game, but is perfect for the African plains. The round has proven to be extremely accurate, with the legendary Ben Comfort winning the thousand yard Wimbledon cup armed with 300 H&H ammo.